The following publications are available directly from the History Group. 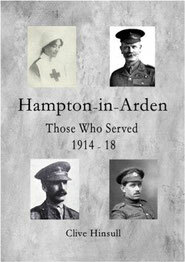 Orders can be placed by email: info@hamptoninardenhistory.org, or by using the form on the Contact page. Prices include postage/delivery within the UK. Overseas buyers please email for shipping charge. 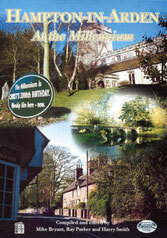 Hampton-in-Arden - A Village History, by Robin Watkin and Mike Bryant. Paperback, published 2006. Hampton-in-Arden's growth and development as a Warwickshire village is carefully charted from Roman times to World War II and beyond. The village's Saxon origins are explained and the story continues with descriptions of the village in the Tudor period and the changes incurred during the Industrial Age. Details of the early years are followed by chapters dealing in depth with the Manor, the village's churches, mills around the parish, the educational changes through the years and the coming of the railway. Subsequent chapters look at inns, sporting activities, the impact of war on the village and the numerous organisations which continue to make up the social fabric of village life. The book concludes with a look at some of the more prominent residents of the village through the years and a survey of some of the events and happenings which took place. The text is illustrated with many previously unseen photographs. Price £15. Out of stock. Hampton-in-Arden at the Millennium, edited by Mike Bryant. Paperback, published 2000. This work is written entirely by village people and reveals how they see themselves. They have supported their descripition and explanations of how the community functions with numerous photographs of residents in action within the many social units operating in this geographic location. In Hampton, residents who work locally or are retired and others who commute to neighbouring towns and cities intermingle freely, and enjoy together the many sports and social activities on offer. Everything suggests an integrated community having many internal facilities and being within easy reach of urban amenities in the nearby cities and towns. This book records activities within the village at the end of the 20th century, and is aimed at providing information for both the present population and for future generations of historians and others. Other changes will come about, but Hamptonians today have every confidence that village life will go on and that many institutions and activities recorded here will continue and expand in harmony with new developments to come. Price £5. Low stock. 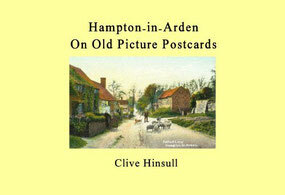 Hampton-in-Arden on Old Picture Postcards, by Clive Hinsull. Paperback, published 2013. A book of Hampton-in-Arden postcards, mostly from the early twentieth century. 104 pages with 110 black and white reproductions. Chapters: The Church and the Vicarage, Solihull Road and the Moat House, Marsh Lane, The High Street, Fentham Road, Around the Village Green, Station Road and Old Station Road, The River Blythe, Marsh Ford and Bradnock's Marsh, Meriden Road and Beyond the Village, Multiviews and the Picturesque. Price £10. Hampton-in-Arden: Those Who Served 1914 - 18, by Clive Hinsull. Paperback, published 2014. Commemorating the people from the village who served in the Great War. 118 pages with 129 black and white illustrations. Price £10. 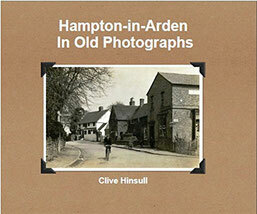 Hampton-in-Arden in Old Photographs, by Clive Hinsull. Paperback, published 2015. 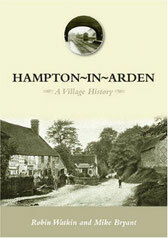 A collection of 88 photographs of Hampton-in-Arden dating from the 1870s to the 1960s. Some of the photographs were published in postcard form but the majority were not. The oldest photographs here pre-date the earliest postcards by more than 20 years. 108 pages including notes. Price £10. Low stock.